Learn about the different types of facelifts and the facial analysis used by plastic surgeons to determine what type of face lift you need. In the old days the term facelift (or face lift) brings images of the super wealthy with a secret swiss surgeon hidden away completely then changing someone's appearance to a brand new person, no longer recognizable. These mental images of a mummy type head bandage being taken down by the surgeon and then the patient miraculously looking great when they come off. This of course is the 1950's image of plastic surgery. Today with the popularity of the plastic surgery television shows this concept of facelift is long gone. Modern plastic surgery is both affordable and more openly discussed. 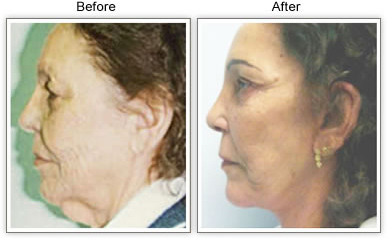 Facelift surgery is both safe and effective at taking years off someone face. The typical facelift patient ranges in age from 45 up to 70 and most say they want to look like they feel. They feel healthy, energetic and enjoy life. However the loose saggy skin or loss of a bright eyed appearance motivates them to see a facelift expert like Dr. Pasquale. Occasionally face lifts are done on patients as young as 23 for such reasons as acne scars or deformity. Facial Zones in regards to Facial Rejuvenation and Face Lift Surgery. To understand facelift it is helpful to think of the face in three zones. The upper, the middle and the lower. Dr. Pasquale's concept of three zones for Facelift and Facial Rejuvenation. There are specific procedures which address each of the zones and the areas to be corrected. Take the person below which is an actual patient of Dr. Pasquale. She had multiple issues which needed to be addressed. This is complex patient for facial surgery which plan was developed by considering all three zones for facelift. 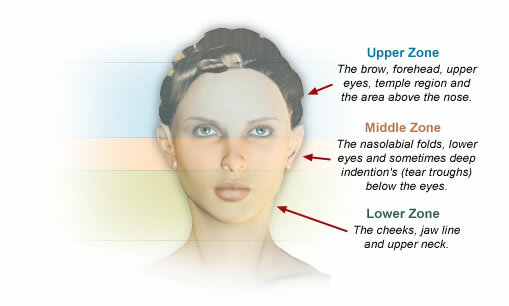 ----- Upper Zone - Coronal Brow Lift, Upper Lids, Lateral Canthoplasty, remove muscle between eyebrows. ----- Middle Zone - Mid Face Lift, Lower Lids, Multiplane Face Lift, and in this case a Rhinoplasty. 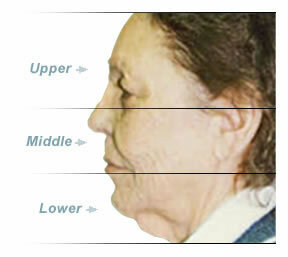 ----- Lower Zone - Lower Face Lift, Neck Lift and Anguloplasty with open excision of playtisma bands. Each of the zones were analyzed and a plan was developed as shown above. When this is put together and the skill and artistry of Dr. Pasquale applied you can see the incredible improvement in the before and after picture below. This is essentially a Total Facial Rejuvenation which more information can be found on our Total Facial Rejuvenation page. A good facial surgeon should look at each aspect of your face with you and discuss a possible corrective procedure and put this plan together. They should examine you closely and plan a procedure to correct each zone individually and integrally. At your consultation, Dr. Pasquale will sit down with you and review all your options, complete with photos and drawings. This will make it very easy to understand the procedures from a technical standpoint as well as the reasons for his recommendations. Each zone of the face should be addressed and a plan to make corrections developed for your facelift procedures.